Regular vaccination is the best course of action to help your pet steer clear of cat flu. However, even if your cat or kitten has been vaccinated it can still be a carrier of cat flu and can infect other cats even though it shows no sign of the disease itself. The old addage 'prevention is better than cure' is definitely the case here but unfortunately many cat owners are unaware of this. Vaccination is not always on their list of priorities, and sometimes it's too late before they act. Of course, there's no guarantee that a vaccination will prevent your pet from contracting cat flu but it usually stops the disease developing in a serious form. There are many different strains of virus, and as is the case with human flu, vaccines will not be effective against all of them. 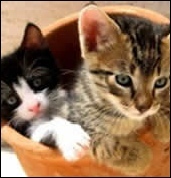 As vaccines will not prevent symptoms developing if a cat or kitten already has an infection at the time of vaccination. You should ensure your cat has an up-to-date vaccination record and a visit to the vet for an annual booster to significantly reduce the risk of infection and the vaccination card must be stumped, signed and dated. And of course vaccination visits also provide an ideal opportunity to get your cat or kitten checked thoroughly for any other potential health problems. A vaccination programme should starts when your cat is a kitten - initially the vaccines will be given three weeks apart. The first of these is administered with a kitten is nine weeks old. Precise timing will relate to the vaccine used and your vet's scheduling policy. Many cat owners are concerned about vaccine safety and potential side effects - but modern vaccines are very effective, and the minor risk of side effects is greatly outweighed by the prevention benefits vaccines provide. It's worth remembering that your cat or kitten, must have an up-to-date vaccination record if you ever wish to leave it at a boarding cattery.